Thanksgiving is one of my favorite holidays.....it's about family and food and the memories created by bringing those two "F" words together! Thanksgiving is about traditional dishes with one or two "newbies" thrown in for good measure! But, I usually fall back to my old favorites, mostly because they have been handed down to me from mom. After all, Thanksgiving IS tradition and memories! AND, by stuffing....I mean stuffing! NOT Dressing! To me, it can only be stuffing if it has been stuffed into the turkey....dressing is made in a dish.....it pales by comparison to STUFFING! Every year, I make my mom's stuffing....the recipe has never been written down, the recipe lived in mom's memory and now it lives in mine and I recreate it every year! It tastes incredible BEFORE it is roasted inside that turkey, BUT, once it has soaked up ALL of those turkey juices.....oh my! It is heavenly! The only thing that is missing from stuffing are those little crunchy pieces that are created on the edges when you bake dressing in a dish....you know what I mean....the crispy, golden brown goodness that forms on the top and along the edges of the dressing! If only stuffing had those crunchy, yummy goodies....it would be perfect! That's how Stuffing Croquettes was created in Sylvia's Kitchen.....stuffing with crispy goodness! In large bowl, mix together stuffing and cheese until well blended. Mix in egg until fully incorporated. Place Panko bread crumbs in small bowl. 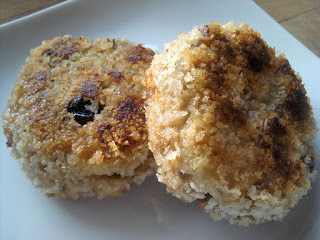 Measure 1/4 cup of mixture and form into patties approximately 1/2" thick and dredge both sides in bread crumbs. Place in single layer and refrigerate for 1 hour. Place oil and butter in saute pan over medium heat. When oil is hot, but not smoking, add stuffing patties and fry until golden brown, approximately 5 - 7 minutes, flip and fry until golden brown on other side.